Location: South side of Clynnog Road where the present day A487 passes under it. Present state: Demolished and a bypass road occupies the station site. 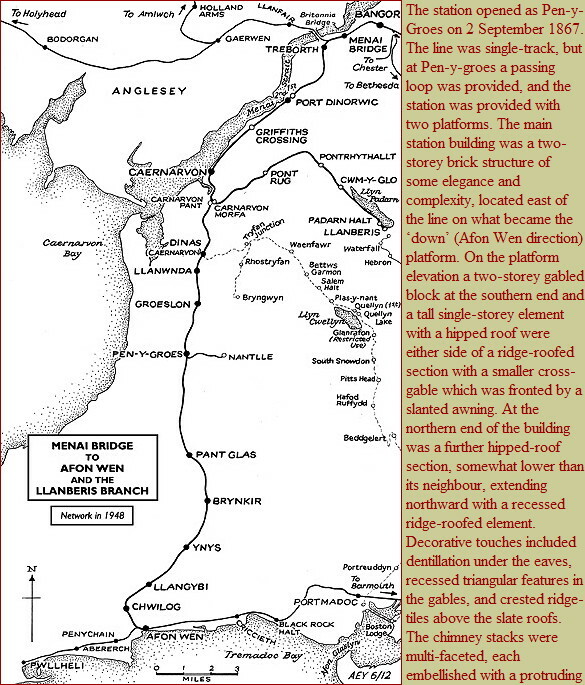 Notes: Penygroes was situated on the Menai Bridge – Afon Wen line which opened in stages between 1852 and 1871. It was on the western edge of the village from which it took its name. The section of line through Penygroes was originally part of the Nantlle Railway, a horse-drawn tramway opened in 1827 linking slate quarries at Nantlle with Caernarfon’s quayside. Passenger services were operated between 11 August 1856 and 12 June 1865, and one of the stations on the line was at Penygroes. Facilities - if there were any - would have been basic. On 29 July 1862 the Carnarvonshire Railway (CR) was authorised to build a line between Caernarfon and Afon Wen. The CR took over the Nantlle Railway between Penygroes and Caernarfon, but not the section up to Nantlle which remained a horse-drawn tramway. In October 1866 the largely completed CR was inspected, but its opening was not approved until 2 September 1867 by which time all work was finished. ledge and square chimney pots with spiked corners. On the frontage the two-storey southern block repeated its platform face, but the northern hipped-roof single-storey section carried a large gable-end, with the recessed triangular decoration. The central section, which carried one cross-gable on the platform elevation, presented two gables to the frontage. Within the building were waiting rooms for both sexes, a booking hall, porters’ office, lamp room, a weigh office, toilets for both sexes and accommodation for the stationmaster. On the ‘up’ platform a stone waiting shelter with slate roof was provided. 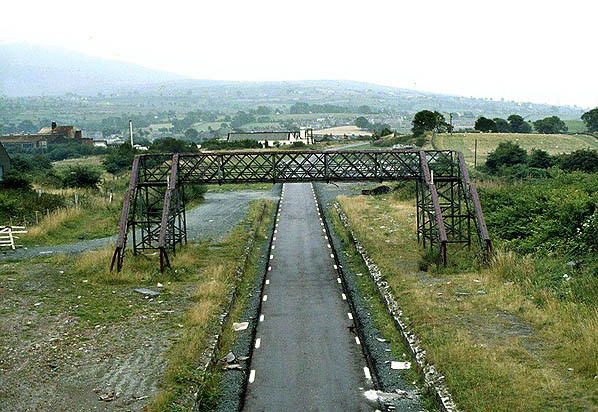 A bridge carried Clynnog Road over the line immediately north of the station building. Originally the platforms ended at the bridge but later they were extended under it northwards. Penygroes had goods sidings west side of the line, south of the station. 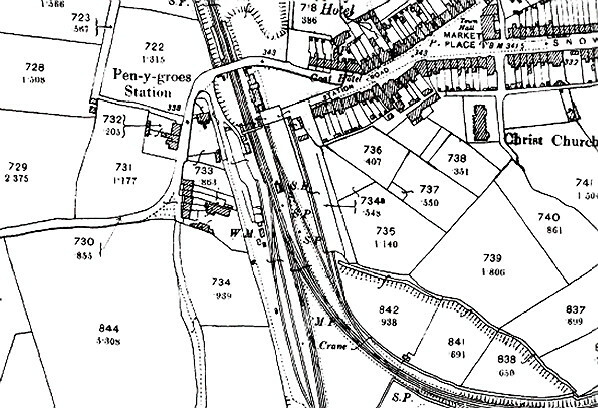 In 1867 there were also transhipment sidings east of the line, again south of the station; the Nantlle Railway terminated at the transhipment sidings. completion of the Carnarvon Town line, trains were able to run between Bangor and Afon Wen. From 4 July 1870 the CR had become part of the London & North Western Railway (LNWR). The quarry owners at Nantlle were frustrated with the situation that existed after the CR had taken over the Nantlle Railway. Previously their products had been worked over the Nantlle Railway direct to the quayside at Caernarfon, but as the CR line was built to standard gauge and the Nantlle was 3ft 6in this was not possible after 1867. Slate had to be transhipped at Penygroes and again at Caernarfon, which added to costs and resulted in more breakages of slates. To improve the situation in 1870 the LNWR took over the section of the Nantlle Railway, extending to just over a mile, from Penygroes to Nantlle. It was converted to standard gauge and connected directly with the former CR line via a junction immediately south of Penygroes station. The converted line became the Nantlle branch and began operation for goods on 1 August 1872; a passenger service was introduced on 1 October 1872. 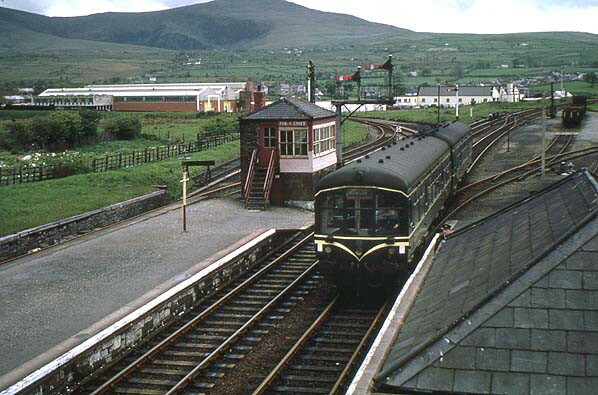 As most of the Nantlle passenger services originated from, and terminated at, Penygroes, a bay platform was created to the rear of the down platform at the southern end. An LNWR 33-lever signal box just beyond the end of the down platform controlled the junction, the passing loop and access to the goods yard. A footbridge south of the station building, linking the two platforms, had also been provided by this time. By December 1895 Penygroes had six up and eleven down trains Monday to Friday as shown in the table below. There were also five services that terminated at Penygroes from Nantlle. Extra trains ran on Saturdays and there was a train in each direction on Sundays. In 1904 the LNWR changed the spelling of Pen-y-Groes to Penygroes. Interestingly they did not alter the signal box nameboard. By July 1922 there were eight up trains and eighteen down trains, eleven of which were Nantlle shuttles, Monday to Friday as seen in the table below. There were twelve services from Nantlle all but the last of which terminated at Penygroes. There was an extra up train on Saturdays and no Sunday service. roof-mounted radiators froze. The experiment was not a success, and so few were the passengers using the line that the Nantlle service was withdrawn for a period between 1 January 1917 and 5 May 1919. On 1 January 1923 Penygroes became part of the London Midland & Scottish Railway (LMS). By 1928 they were running twelve up and nine down trains Monday to Friday with only a few services on the Nantlle branch. A few years later, in summer 1932 there were ten up and nine down main line trains and twelve services each way on the Nantlle branch Moday to Friday. Passenger services to Nantlle ceased on 8 August 1932, but excursion trains continued until 1939. Railways London Midland Region. The summer 1948 timetable showed eight up and eight down services Monday to Friday with retimed trains and an extra up train on Saturdays as shown in the table below. In 1939 Billy Butlin built a holiday camp at Penychain on the former Cambrian line to the west of Afon Wen. Due to the war it did not open for holidaymakers until the summer season of 1947 although it was used during the war by the Royal Navy. The opening of the holiday camp brought a lot of extra traffic in the form of holiday specials to the Menai Bridge – Afon Wen line during the summer months which were much longer than the routine service trains. At many of the stations, including Penygroes, platforms were lengthened. Even the scheduled services had improved by the mid 1950s. The summer timetable for the Summer of 1955 showed ten up and eleven down trains Monday to Friday as seen in the table below. On Saturdays there were sixteen up and seventeen down services but no service on Sundays. DMUs were introduced onto many services from 1958. The line remained busy in the summer months into the 1960s but during the winter period it was very quiet. Goods services on the Nantlle branch ceased on 2 December 1963. By the end there was only a single train, and it ran only on alternate days. The Reshaping of British Railways (‘Beeching’) report of 1963 recommended that the line between Caernarfon and Afon Wen be closed completely. This was despite the very heavy holiday traffic in the summer. 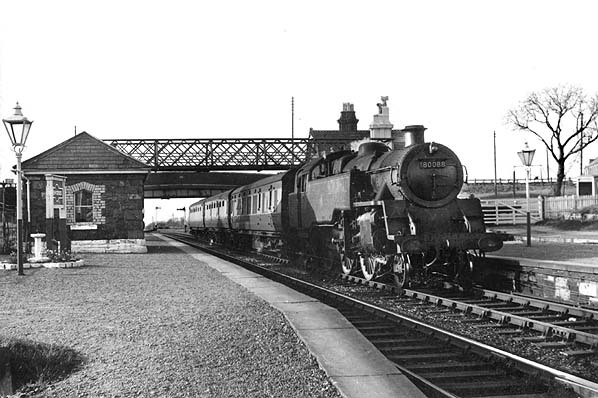 Interestingly in 1964 steam-hauled trains were used on most services with DMUs being sent elsewhere. The line closed completely on 7 December 1964 with the last services running on Saturday 5 December. of Penygroes by MacAlpines; it ran from Llanwnda and Pant Glas and was used by lorries carrying stone. 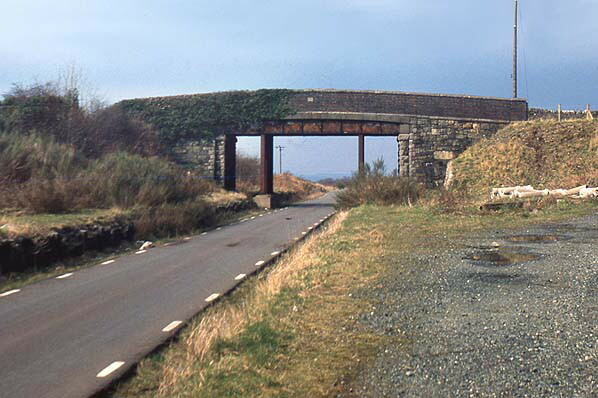 In 2000 the Penygroes bypass was constructed along the trackbed through the site of Penygroes station leaving no trace of it. 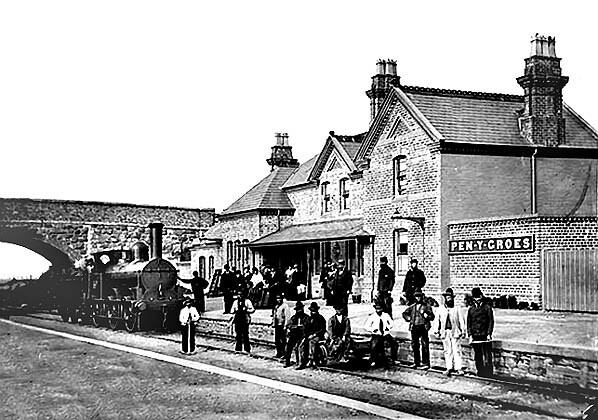 Penygroes station in 1867, possibly shortly before opening. A construction crew stands on the down line, with other railway staff on the platform and by the engine. Others had also gathered at the station to be in the photograph. When the station opened it was called Pen-y-Groes. 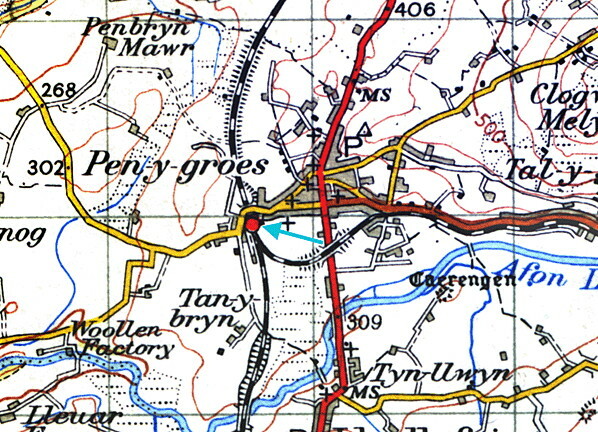 Penygroes shown on a 1900 map when it was still Pen-Y-Groes. 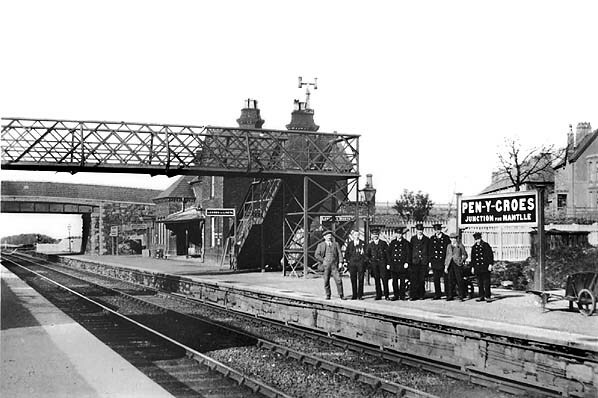 Penygroes station in 1910. Staff pose by the station nameboard which at showed the original spelling Pen-Y-Groes even though the LNWR changed it to Penygroes in 1904. The sign also made it clear that this was the interchange point for the Nantlle branch. 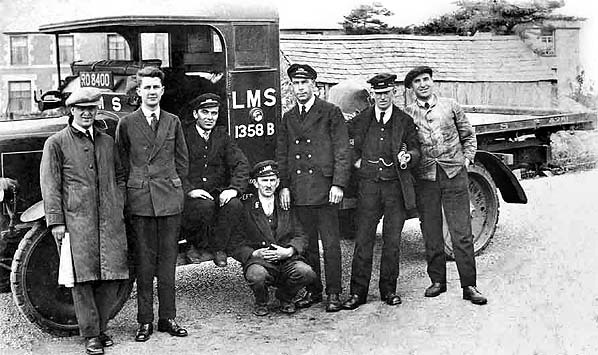 In the 1920s the LMS introduced lorry delivery services from many of its stations including Penygroes. The lorry allocated to Penygroes number 1358B is seen in this photograph with station and yard staff. 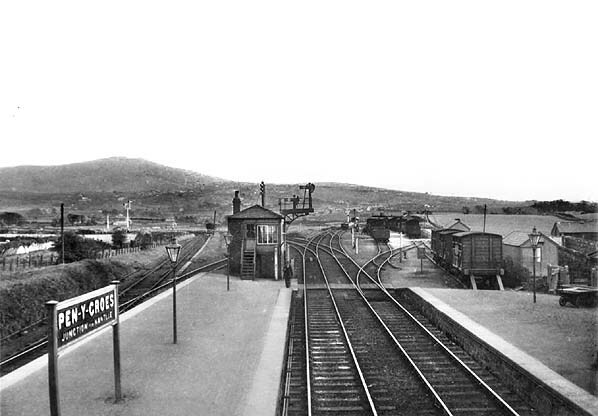 Looking south at Penygroes station from the footbridge in 1930. The picture gives a good overview of the south end of the station. To the right of the line beyond the platforms can be seen the goods yard. Curving off to the left beyond the signal box is the Nantlle branch. Running behind the signal box and into the down platform bay is the line that the Nantlle-Penygroes shuttle service used. Looking north at Penygroes in the mid 1950s as a local train calls en route to Afon Wen. At the head of the train is locomotive No. 80088 carrying a single lamp on the top of the smokebox denoting a class B train. The loco is a BR standard class 4 passenger tank. Designed by R.A.Riddles and built at BR’s Brighton works, 80088 entered service on 14 July 1954 at 26D, Bury shed. It had a short service life of only 10 years, 10 months and 30 days when it was withdrawn from 75B, Redhill shed and broken up shortly after at Birds of Morriston. One of a class of 155, these standard 4s shared much of the basic design of the LMS designs of Stanier and Fairburn, but with considerable improvements. They had smaller cylinders and higher boiler pressure; they were more economical and were very popular with crews for the better riding and improved cab facilities. A Derby Lightweight DMU is seen arriving at Penygroes on a Bangor service on 22 May 1962. the picture was taken from the station footbridge and gives a good view of the junction that was located to the south. Beyond the signal box the Nantlle branch can be seen going off to the left. Penygroes station seen looking north from the up (Menai Bridge direction) platform on 14 August 1962. Working a stopping passenger train is a Stanier-designed 2-6-4 passenger tank locomotive number 42446. Built at Derby works, this loco entered service on 6 June 1936. One of a class of 206, it lasted until withdrawal from 6H, Bangor shed, on 25 April 1964 and was then cut up in December that year at a Rotherham scrapyard. Looking south from the down platform at Penygroes in 1966 two years after all traffic ceased. The main line was in situ although the goods yard had been lifted. Discussion did take place with regard to running stone trains from Nantlle but, in the end, lorries were used. 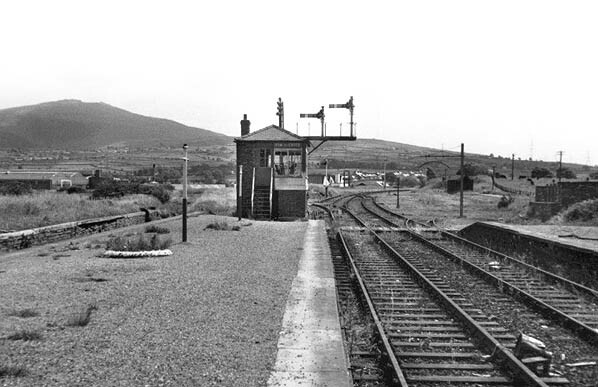 By 1975 the station buildings at Penygroes and the signal box had been demolished. 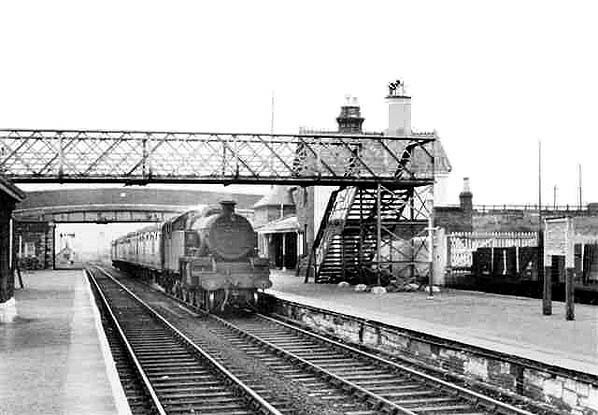 Amazingly the footbridge was in situ, and the platforms could still be seen. The track had been lifted and replaced with a haulage road which used by lorries to carry stone between a quarry near Pant Glas and Llanwnda. Looking north along the down platform at Penygroes in March 1982. The station building stood on the area of bare ground to the right. The site of Penygroes station on 25 May 2012. A bypass road had been built on the trackbed and all traces of the station had been swept away.